Garmin StreetPilot c310 has been discontinued. Accessories, spares and parts are still available for your StreetPilot C310, as are road maps. The Garmin StreetPilot "c-series" GPS navigators feature a simple touchscreen interface, with automatic route calculation to any destination and turn-by-turn voice-prompted directions along the way. Selecting a destination is straightforward and requires only a limited amount of input from the user. Plus, the StreetPilot c310 offers a three-dimensional navigation view or an overhead view. The new Garmin StreetPilot c-series boasts distinctive and sleek styling - the only buttons are a rotary volume knob and an on/off switch. The Garmin StreetPilot c310 GPS device is secured by a suction-mount cradle that fastens to the windshield for easy portability between vehicles. Users can customize their unit's appearance with an array of colored faceplates (sold separately). Looking for accessories and spares for the Garmin StreetPilot c310 view them all here. 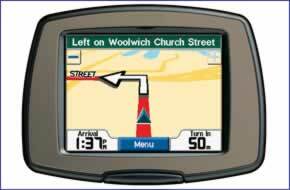 All parts are genuine Garmin product and specifically designed for use with the StreetPilot c310 sat nav. Question: SD card for Garmin street pilot c310 would SD card update my maps etc? Thanking you. 4. You will then have the latest street-level road maps of the UK and Ireland on your StreetPilot. Do you have a question about the Garmin StreetPilot c310? Submit your question via our contact page.